Paris’ bridges might just be the most romantic part of the city. Beautiful in and of themselves they present a constant opportunity to view the river and the city from different angles. 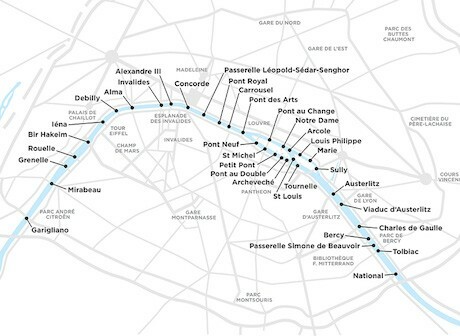 Below are a few of my favorite bridges in the city of light and after a walking tour you can print out that takes you on a number of bridges through central Paris. Passerelle Léopold-Sédar-Senghor This fairly new bridge connecting the Tuileries Gardens with the Musée d’Orsay enjoys a particularly beautiful view of the city, and it warrants a stroll across. Pont Alexandre III Links the Invalides to the Grand and Petit Palais. Built in 1900 for the World Expo, it is certainly the most lavish bridge in town, with cherubs and lions installed to celebrate the relationship between France and Russia. It is an over-the-top Art Nouveau–style masterpiece. Pont Marie Links the Ile-St.-Louis with the right bank of the Seine and is the second-oldest bridge in Paris, dating from 1614. Legend has it that if you make a wish underneath, it will be granted—hence the nickname Lovers’ Bridge. So if you are back in Paris with your lover (or your hubby), give him a kiss here for good luck! Pont Neuf Connects the left and right banks through the tip of Ile de la Cité and deposits you at a lovely park, the place Dauphine. 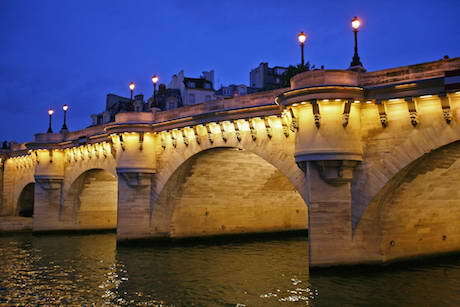 Dating from 1607, it is the oldest and, I think, most beautiful bridge in Paris. Pont St. Louis This bridge isn’t spectacular or exceptional in its design, but it connects the two islands and is often a nice place for a stroll, from behind Notre Dame toward Ile-St.-Louis. In summer you’ll find street performers here. Of course I’d be remiss if I didn’t mention the controversy that has erupted over the past few years about the locks on the bridges. At first I thought it was a charming idea and now that we’ve seen so many locks especially on the Pont des Arts as well as the bridge behind Notre Dame it seems these lover’s locks put on as a romantic gesture are harming these beautiful bridges. As a tourist it is strongly recommended that you not participate in the practice of placing a lock on a bridge, seal your love with a kiss and a photo instead. You can take your own bridge-oriented day tour by printing out this page before you go and brining a good map or your smart phone. Wear your sneakers or very comfy shoes, as this is a long jaunt. This walk is over three kilometers and will take you over an hour if you do not stop—but the fun is in stopping. Taking a leisurely pace with a break for lunch, you’ll spend at least three hours; if you stop at museums or Notre Dame, this is an all-day affair. Begin at the pont Alexandre III, crossing from the left bank to the right, pausing to admire the bridge as well as the spectacular view. Stop in at the Grand Palais or the Petit Palais if you are interested in any of the current exhibitions. Walk down the Champs Élysées toward the Louvre and stop to admire the place de la Concorde, where Marie Antoinette had her head chopped off! 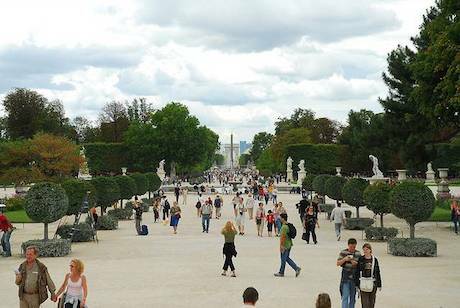 Continue on, heading through the Tuileries Gardens toward the Louvre, admiring the sculptures along the way. Stop if you get hungry for a crêpe. About halfway through the Tuileries, turn and take a walk on the pedestrian bridge Passerelle Léopold-Sédar-Senghor (on old maps it’s called the pont Solferino). This has a particularly lovely view of the Musée d’Orsay and all of central Paris. If you are really feeling vigorous, take a walk through the museum (62, rue de Lille; 01 40 49 48 14), or return another day. 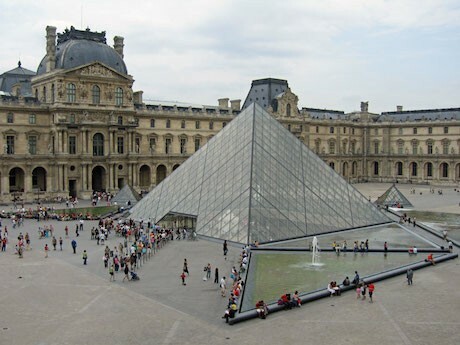 Go back into the Tuileries Gardens and walk straight toward the Pyramid, designed by I. M. Pei, and past it toward the back part of the palace (the Louvre). 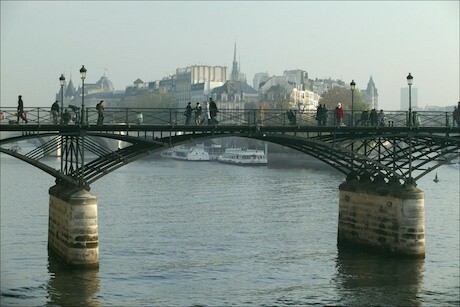 Then take a right to cross the pont des Arts. This is another beautiful pedestrian bridge that is often crowded with picnickers on summer weekends. Stay for a while on the left bank, browsing through the booksellers (les bouquinistes), who have been selling their antique books here by the Seine for over 400 hundred years. Stroll back over toward the right bank via the pont Neuf (the oldest bridge in Paris, though it is named the “new bridge”), cross only halfway and you’ll find you are on the Ile de la Cité. Stop for a much-needed rest for lunch at any of the darling cafés at the place Dauphine—one of our favorites is Taverne Henri IV, which is a wine bar serving affordable wines and charcuterie (13, place du pont Neuf, in the 1st; 01 43 54 27 90. Noon–10; closed Sat evenings and Sun). Walk through the Ile de la Cité—stop at the Conciergerie, Sainte-Chapelle or Notre Dame and then continue, finally, on to Ile-St.-Louis via the pont St.-Louis. Some good window (and real) shopping can be had on rue St.-Louis-en-l’Ile, which travels squarely down the middle of the small island. 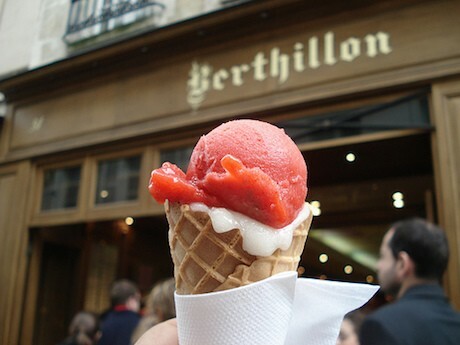 Berthillon (31, rue St.-Louis-en-l’Ile; 01 43 54 31 61), Paris’s most famous ice cream store, can be found here—look for the long lines. Cross to the right bank to end your tour by exiting on the pont Marie—also from the 1600s—and make your wish! You are right near the Hôtel de Ville (city hall), where there is a taxi stand and a metro station. If you still have energy, stop in at the Hôtel de Ville, on the rue de Rivoli. They usually have an interesting free exhibit going on. Mappy is a terrific service that will map your strolling routes for you.